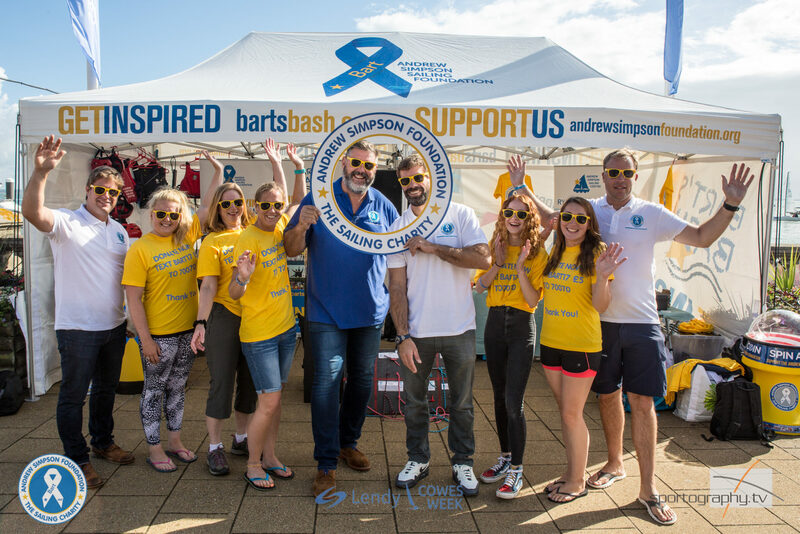 Today the Lendy Cowes Week spotlight shone brightly on the Andrew Simpson Foundation (ASF) with the day being officially designated Charity Day and with Founding Trustee and America’s Cup sailor Iain Percy OBE in Cowes to fly the FUNdraising flag. The ASF is delighted to have been selected as the official charity in this first year of Lendy’s title sponsorship and has been setting out to practically demonstrate just what a difference it can make to the lives of young people across a whole range of charitable activities being delivered during Lendy Cowes Week, afloat and ashore. Iain Percy was honoured to be invited by Lendy Cowes Week and the Royal Yacht Squadron to fire the start gun for Cowes Bash and the first race of the day. As a reminder of why the Foundation was formed and in a nod to the global fundraiser ‘Bart’s Bash’, results from all fleets were pooled to find an overall winner for the day. Congratulations go to the winner of Cowes Bash, just confirmed as Sam Cox on Nifty, a King 40, who picks up a free entry into next year’s Lendy Cowes Week plus a range of Chatham Shoes for the crew and some Musto kit. In between a host of media interviews and photo calls Iain enjoyed meeting young sailors signed up to one of the ASF’s primary initiatives running this week, Discover Sailing supported by Lendy, a series of daily one hour taster sessions to introduce 8-14 year olds to the delights and challenges of sailing. The ASF Discover Sailing Programme ensures there are no financial barriers to entry into the sport. To date the Andrew Simpson Foundation has introduced 5,600 young people to sailing. Iain also met the team from chronyko who have been working closely with the Foundation to develop the Six Pillars of Wisdom that dominate Cowes Parade; a series of puzzles that have received a great level of interest from spectators of all ages and caused some head-scratching moments. There are strong parallels between the approach of the two organisations and their belief in the importance of skills development. Whether the delivery of that skills development is through chronyko’s immersive training events or the ASF’s many sailing programmes, it is backed by a set of shared values. There was more fun to be had when Iain took on his brother Richard who is the CEO of the Foundation and ASF supporter Sir Keith Mills, in the Sunsail Gutterboat Racing Challenge. Iain also raced Olympic Silver medallist and the ‘Face of the Foundation’ at the regatta, Mark Covell, who went on to host the Foundation’s ‘Big Bash’ party on the main stage in Cowes Yacht Haven; a great big wonderful party with fabulous prizes, on-stage entertainment, putting the FUN into FUNdraising! Remember to text your donations to BART17 £5 to 70070.